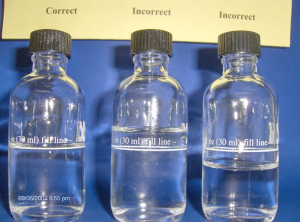 Please use the fill line, any quantity below fill line will hamper efforts at the lab, any amount above fill line is a violation and may cause fines with FedEx under excepted quantity procedures. 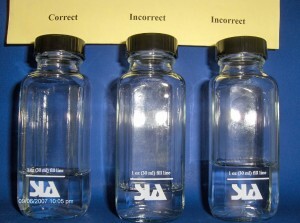 2CG-144 Kit: Clear 2 oz. glass Boston round bottle with 20 mm neck and 1 0z. fill line. Packaged 144 bottles per kit with lids, zip-locks, and white absorbent pads. Used in conjunction with the PV20 pump for fuel sampling. The 2-CG bottle is used with the MB-15 shipper box for fuel specimen shipment to the laboratory. A-144: 144 (6×10) White absorbent pads which will absorb diesel fuel, commonly used for small spills and vividly shows red dyed fuel when placed on the pad. Will NOT absorb water. Please note: When using the phenolic lid, the inner liner can separate from the lid and stick to the bottle, especially with long-term storage. When the lid is unscrewed from the bottle, check to ensure that the liner is in place within the lid. Do not over tighten the phenolic lid, it will crack.